Team Antelope Valley is Underdog…So What’s New About That? Massey Ratings has Antelope College a 4.5 point underdog on Thursday’s game against San Francisco City. Looking at it in a different way, San Francisco has a 66% chance of winning verses a 34% chance to win for AVC. San Francisco City 82 AVC 77. Saddleback 7.5 point favorite AVC (AVC 79 Saddleback 67) Massey was 19 points off in prediction. Citrus 4.5 point favorite over AVC (AVC 74 Citrus 71) Massey was 7.5 points off in prediction. 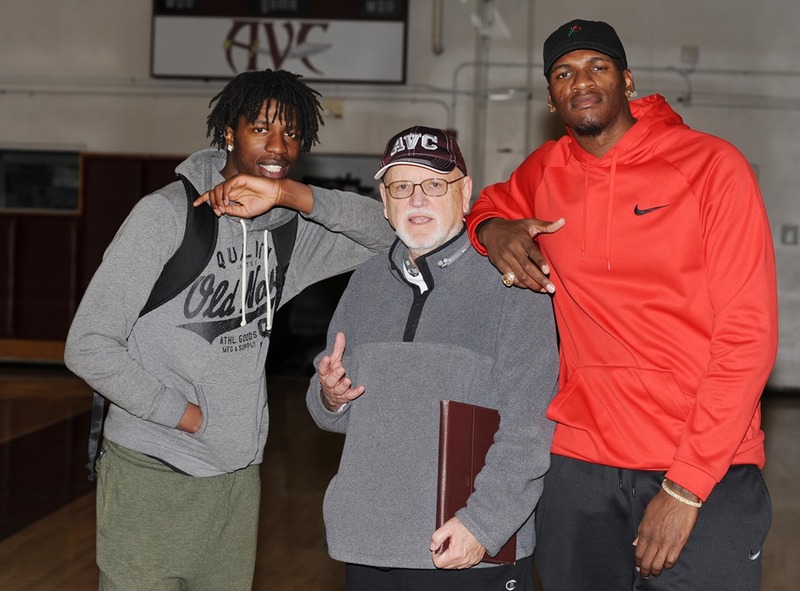 The AVC basketball team seem’s to be enjoying their role of underdog in the Regional Playoffs and now the State Championship round. They were expected to lose every game as they had to play all of the top seeded/ranked teams on the road. And win they did. They…sophomore Anton “Ace” Warren, 6’10”, 265 and freshman Osinachi Nwachukwu, 6’4, 190…even had time to take a photo with a fan who is enjoying the 2016-17 season. Today is AVC’s last home based practice before they head to their first round of the State Tournament. AVC’s Dewayne Dedmon…Opt Out Spurs…$15 Million Year….Stay With Spurs…$11 Million a Year??? ?